Hello! I am directing a fan dub of every chapter of the JoJo's Bizarre Adventure spin-off: "Thus Spoke Kishibe Rohan." "Thus Spoke Kishibe Rohan" follows the side character of Diamond is Unbreakable, Rohan Kishibe, on his strange journeys as a mangaka, It seems no matter what he's doing, he always ends up in some bizarre business. This chapter starts with Rohan in Italy! Read the synopsis below for more info! After an incident forcing him to pause his series Pink Dark Boy for the summer, Rohan decides to take a vacation in Italy. As he was visiting Venice, Rohan decided to research to churches, especially for their architecture and spiritual background. He walked into a confession booth to research the interior, but mistakenly into the side reserved for the priest. 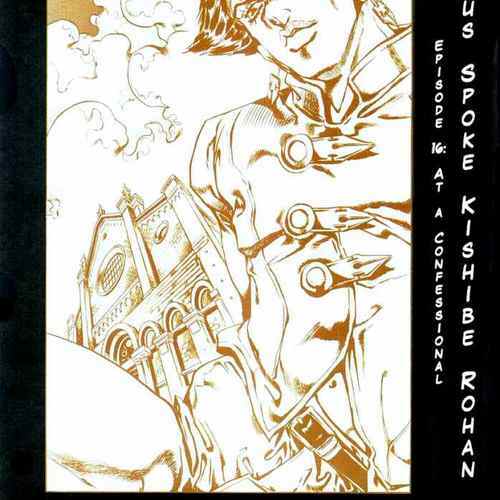 Shortly after, a man entered the other side of the booth and confessed his sin to Rohan, believing him to be the priest. Interested in getting information out of the man, Rohan heard out the confession. It is this man's 'confession' that is the episode of sheer terror of murder and betrayal! The story of a great grudge. [Confused] Ho... Hold on... I just want to make sure. You said that the last he spoke to you was after he had died? Are you sure you weren't seeing a dream? [annoyed] I earn my money by working and buy my food with that. Why don't you do the same? [scared] Why.....!! Why is this happening to me....!! Please...... Will you give me some food, sir? [Disgusting voice] DID IT APPEAR TO YOU THAT I WAS SLACKING!? [Disgusting voice] I will comeback! When you are at your happiest moment! I will come to take you with me! You used your money to make me get plastic surgery! You deceived me! When your daughter is at her happiest moment... I will come for you!